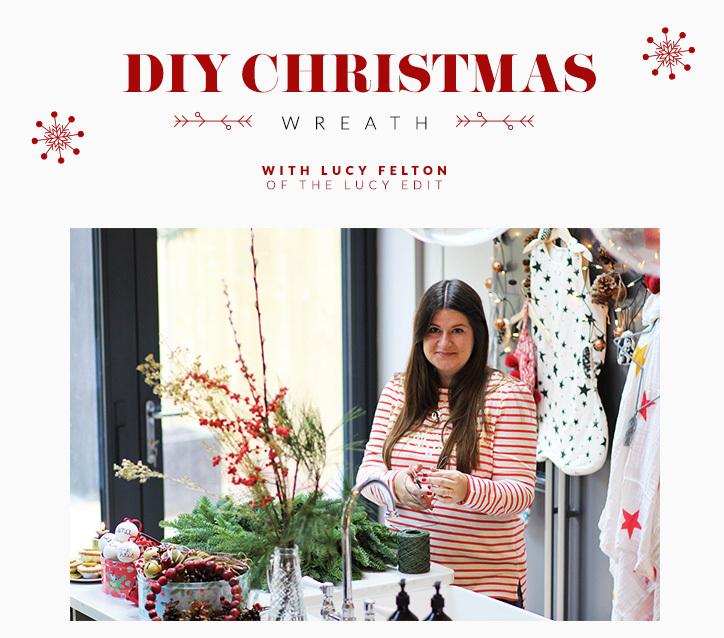 It’s December which officially means Christmas is go, so we’ve recruited fashion journalist and lifestyle blogger Lucy Felton of The Lucy Edit to guide us through making our very own Christmas wreath. Hands up, at seven months pregnant I’m 100% guilty of out-of-control nesting. Anything to make my home cosy and I’m there. Luckily, Christmas is the perfect excuse to get my nesting on. Last time in my mamma-to-be series I talked about Pregnancy Survival as I embarked on my debut journey with bump. Seeing as it’s Christmas, this time I’m encouraging you all to take some time out and get your creative juices flowing by DIY-ing your very own Christmas wreath. It’s easier than it looks, I promise! There’s something so unique about this time of the year, and whether it’s baking mince pies or hitting Christmas markets with the kids, this year why not add a new homemade tradition into the mix? 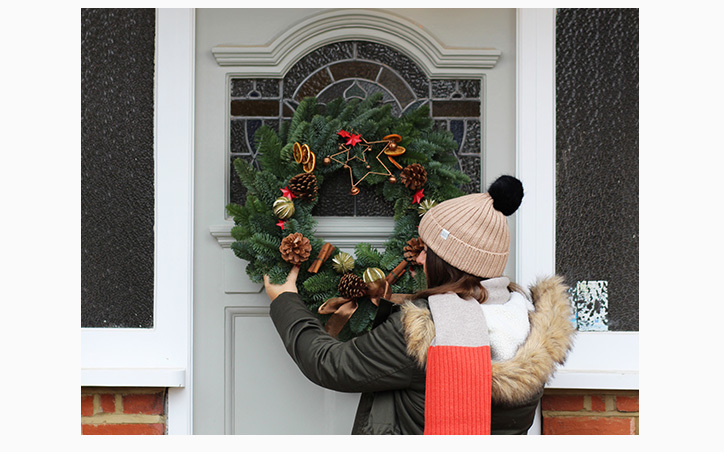 So if you fancy putting the wow into your Christmas décor this season then join me on a festive wreath foray. Sure beats a few sprigs of holly or mistletoe, huh? Wishing you all a happy, bright and extra magical holiday season. – Your decorations of choice. For me, it’s a medley of natural pinecones, cinnamon sticks, dried fruit and baubles. 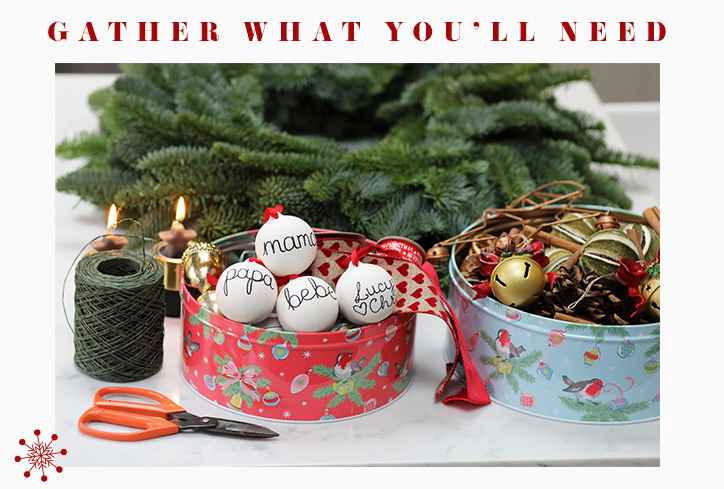 You can use any kind of tree trinket – these metal stars add a nice pop of red, and I’m a sucker for personalised everything too. Hello Henry’s Mama, Papa and Bebe ceramic pretties were a real find. 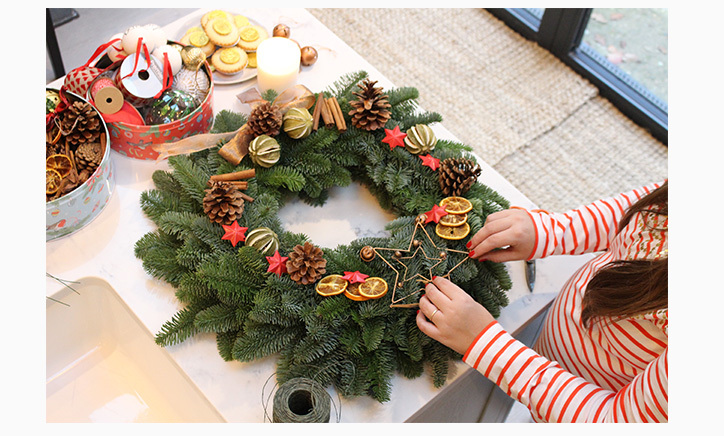 Play around with decorations and place each piece on the wreath until you’re happy with the look. Position larger trophy items first, and use smaller items to fill in any gaps. Use a big bow to anchor the whole theme. I’ve gone for copper here to mirror the cinnamon, pinecones and large metallic star at the top. Use generous lengths of floristry binding wire to attach your chosen decorations to the wreath. Start by wrapping and winding the wire around the object, twisting to tighten each at the base. 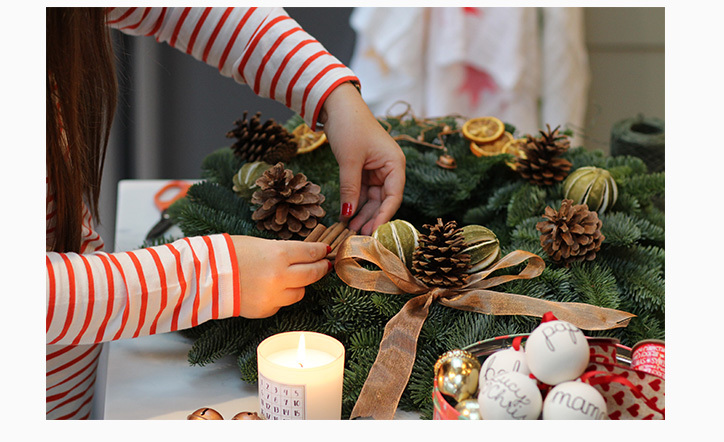 Then place on the wreath and loop the wire around to the back and twist again to fix in place. Try creating interesting stacks and clusters by grouping cinnamon sticks, stars, bells and orange slices together. Once you’re finished, lift gently to double check everything is firmly secured. Hang on the front door or lay flat on a table with pillar candles standing in the middle for a unique centrepiece. 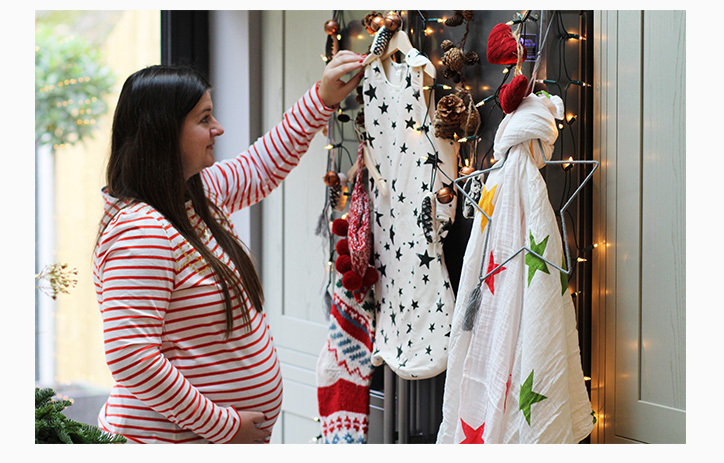 Now you’ve prettied up the house, it’s time to get on with enjoying the other crafty Christmas traditions. I like to wrap my parcels with the log burner lit and Christmas songs playing. To make things a little easier, I’ve edited a wishlist of Alex and Alex’s best Christmas gifting options below. 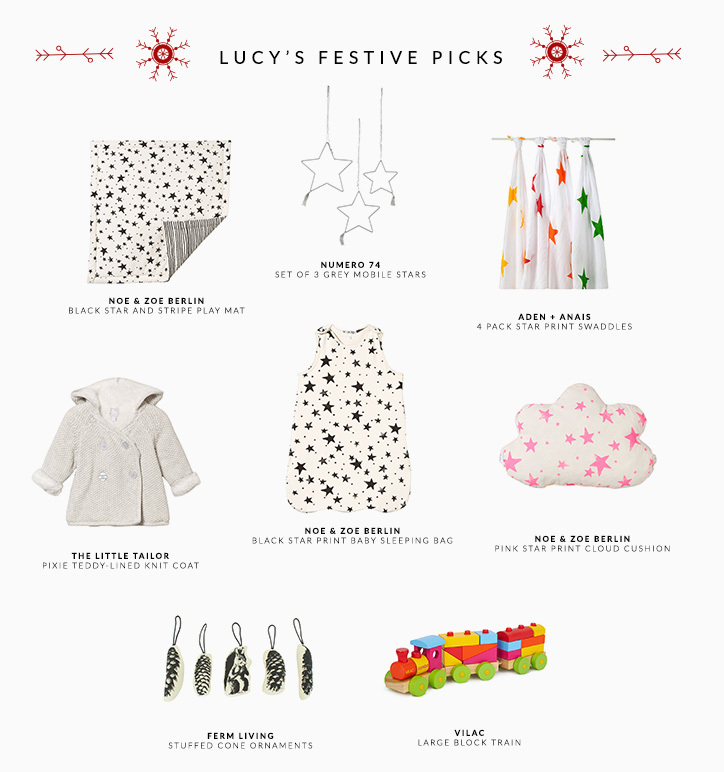 From super soft knitted coats to colourful wooden toys, there’s something for every little one.